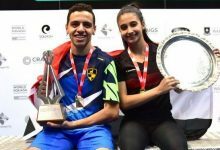 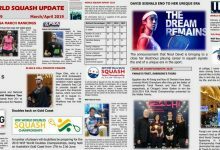 Peruvian teenager Diego Elias and US 22-year-old Olivia Blatchford claimed surprise places in the gold medal play-offs in the 2015 Pan American Games in Canada after upsets over the No.2 seeds in the Squash Championships in Toronto. 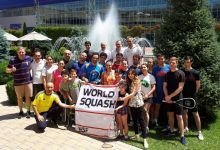 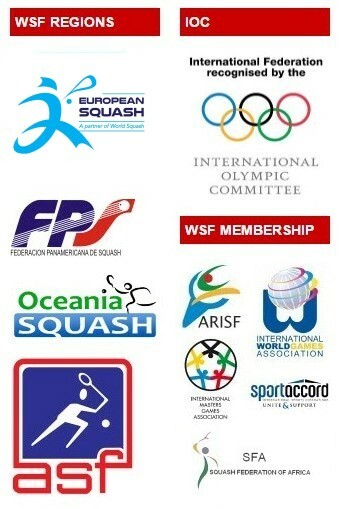 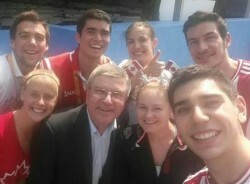 A day after meeting Thomas Bach during the IOC President’s visit to the squash action at the Exhibition Centre in Canada’s biggest city, 3/4 seed Elias (pictured right – 2nd left, top row – in squash group with Bach) ensured medal opportunities for Peru for the first time in PanAm Games’ history when his semi-final opponent Cesar Salazar, silver medallist in 2011, retired injured with score at 7-11, 8-11, 11-5. 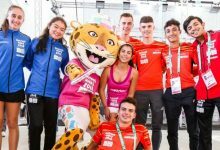 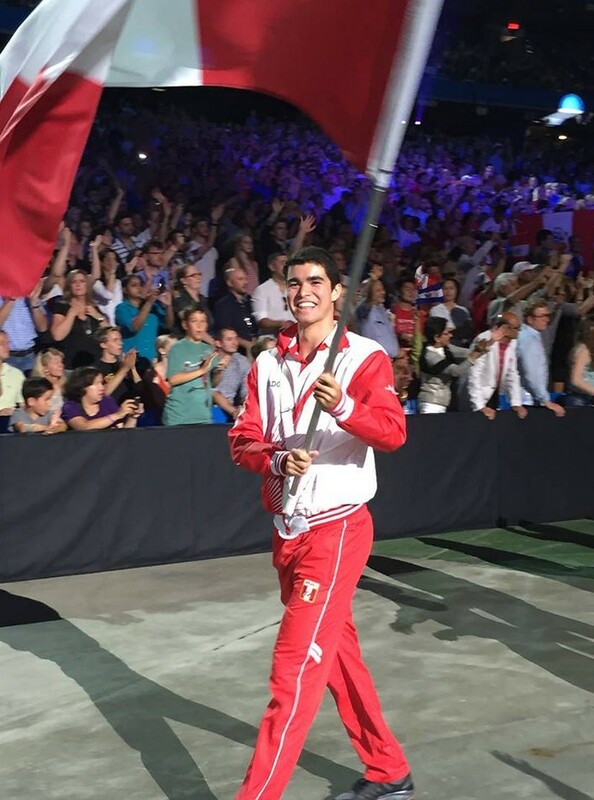 Elias, the 18-year-old world No.43 from Lima, who carried the Peruvian flag at the opening ceremony (pictured, left), will face defending champion Miguel Angel Rodriguez, the world No.4 from Colombia. 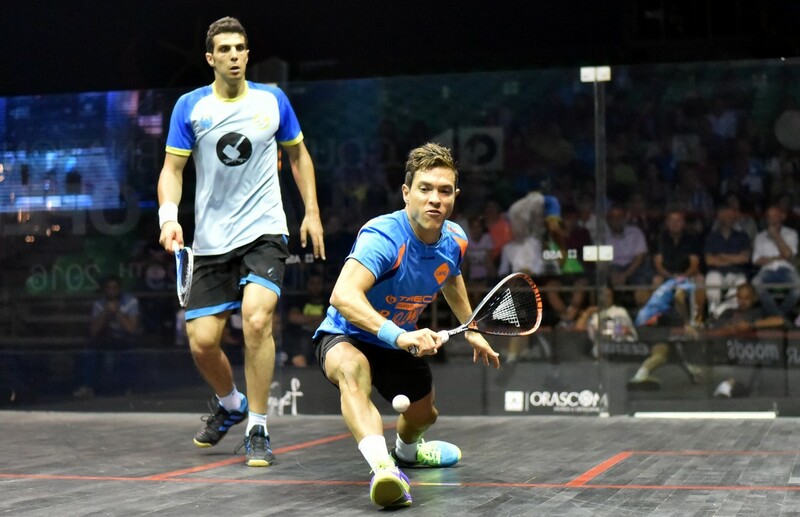 The 29-year-old from Bogota brushed aside Canadian Shawn Delierre, the other 3/4 seed who was celebrating his third successive appearance in the semi-finals, 11-7, 11-8, 11-8. 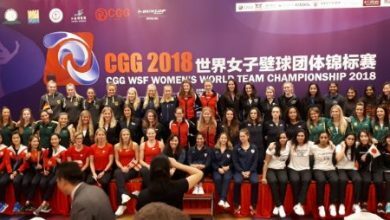 The women’s event comes to a surprise all-USA climax after New Yorker Blatchford stunned second-seeded Mexican Samantha Teran, the 2011 gold medallist, 11-7, 11-6, 11-7 in 30 minutes. 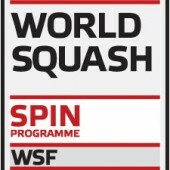 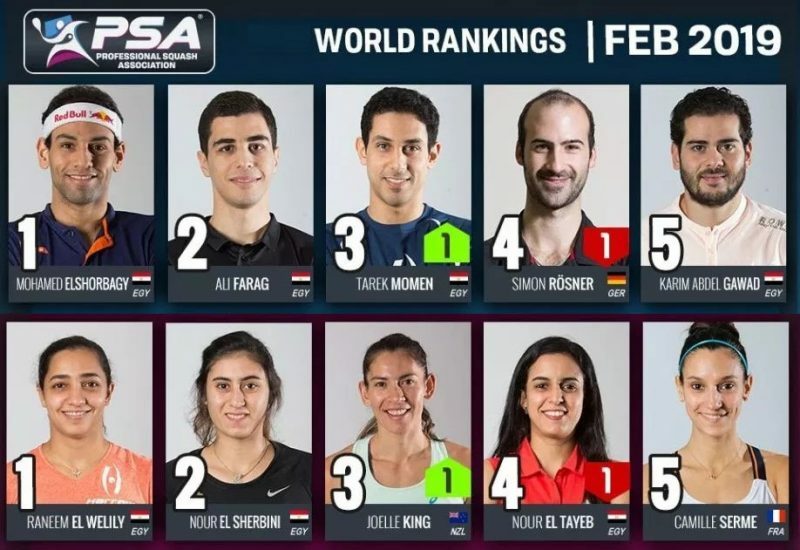 The 3/4 seed will face US team-mate Amanda Sobhy, the top seed who graduated from Harvard University earlier this year. 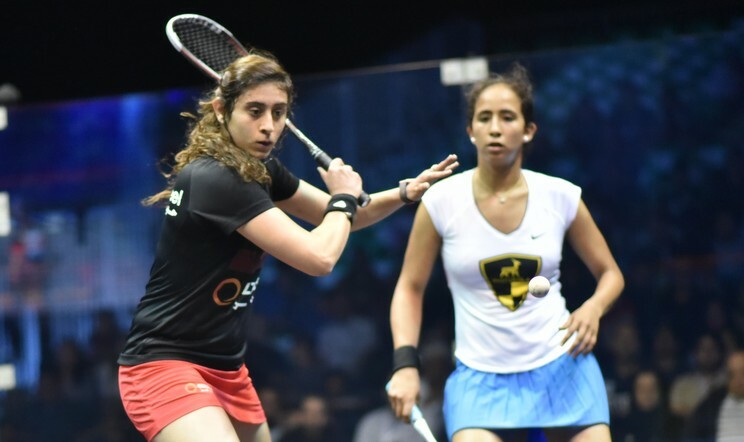 Sobhy, ranked 10 in the world, ended home interest in the women’s event when she beat Canadian champion Samantha Cornett, silver medallist in 2011, 11-2, 3-11, 11-4, 11-6. 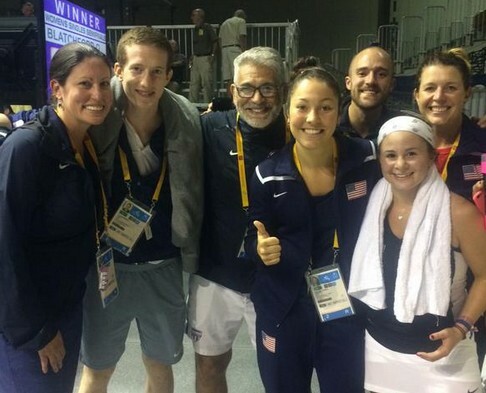 “I am so happy for Amanda because here is a girl playing for her country and has been No.1 for some time and she handled herself so beautifully under a lot of pressure against Cornett and in front of the home crowd,” said Paul Assaiante (pictured, right, third from left, with the US team), US Squash Head National Coach. 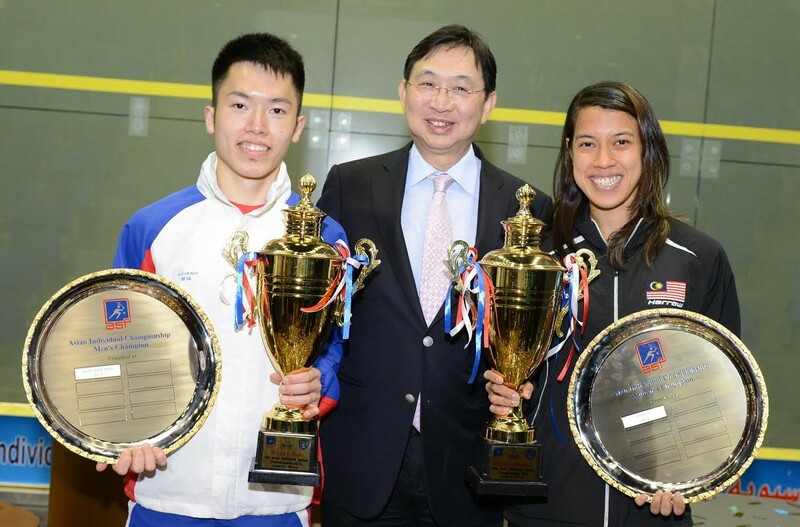 “It was impressive to see how confident Olivia was against an extremely experienced player. 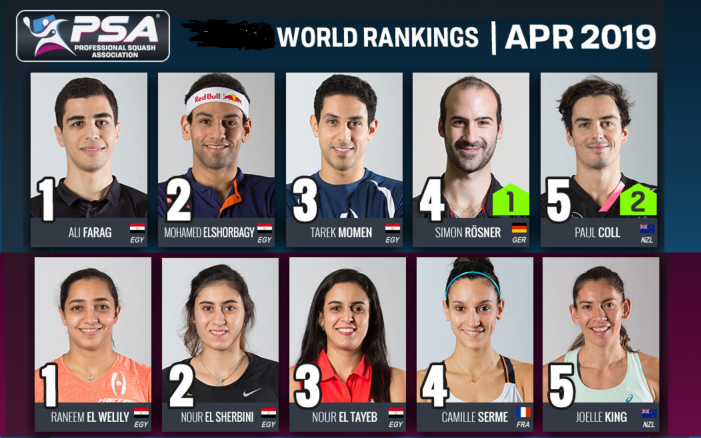 She has made us all proud to have two players in the Finals tomorrow. 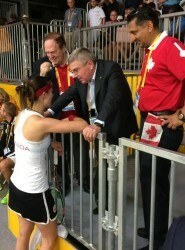 Thomas Bach witnessed Cornett’s impressive opening round victory, when the 24-year-old from Ottawa despatched Guatemala’s Pamela Anckermann in straight games. “With so many sports to watch, how exciting to have IOC president Thomas Bach at the squash courts today,” said Cornett (pictured left, in conversation with Bach). 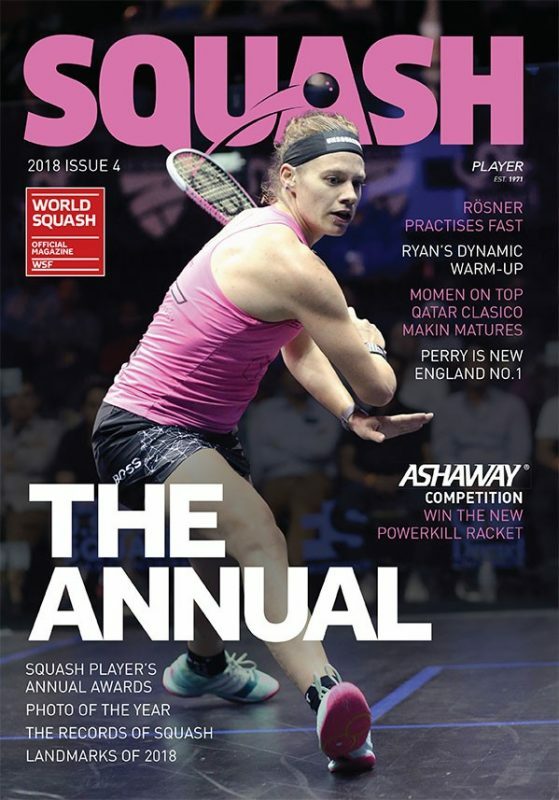 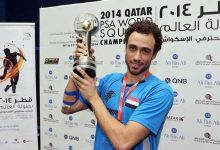 “I am honoured he watched me play, happy to have met him, and I can only hope he enjoyed the match enough to consider squash for 2020.